After allying Lillian’s Ivory Guard, Becca is determined to round up more like-minded demons and Ebonys that could help in their fight against the old system. She knows her actions draw unwelcome attention and that she has to be careful now more than ever before. So, is she foolish to trust Stone, the man who saves her brother's life - and stirs her blood? Stone is as cold and hard as his namesake. When he infiltrates a group of rebellious demons to find out how far the do-gooder attitude has spread, he doesn’t even blink at his orders to kill the leader. What he didn’t count on was Becca - the hot whirlwind turning his world and heart upside down. ...and all hell breaks loose. 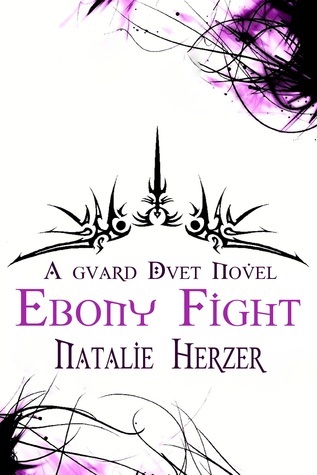 After reading and loving Ivory Guard I dived straight into Ebony Fight. The story picks up where Ivory Guard left off but without Lillian and Raz as the central characters. This is very much Becca's story and it is a compelling one. To me, Becca is one of the most honest characters in that she doesn't paint herself as wholly good or wholly bad, even though in my eyes she is quite saintly. She acknowledges her inner demons and fights to stay true to her own beliefs and good intentions. I love how she is able to use magic and uses it selflessly to save others. She has undertaken the task of spreading the word among the demon world which garners her the wrong kind of attention resulting in Stone, an assassin, being sent to kill her. He doesn't pose much of a threat to her as it isn't long before he is falling in love with her. However, it isn't just Satan that needs convincing. Stone isn't the only one out to stop Becca and the threat may be closer to home than they realise. The Guard Duet series is irresistible and I recommend it to all readers of paranormal, fantasy and romance.